4 Times brighter than standard engineer grade reflective tape. Easily cut to size or shape required. Glass beads are encapsulated in a honey comb design thus creating a much brighter retro reflective tape. Will adhere to almost any smooth, clean surface; Bends around curves but does not stretch, adhesive backing. Clickforsign 2 Inch White Reflective Adhesive Tape, 2 feet is a premium quality Warning Tapes from Clickforsign. 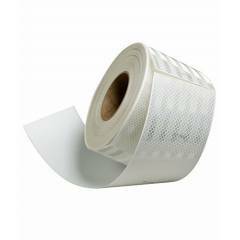 Moglix is a well-known ecommerce platform for qualitative range of Warning Tapes. All Clickforsign 2 Inch White Reflective Adhesive Tape, 2 feet are manufactured by using quality assured material and advanced techniques, which make them up to the standard in this highly challenging field. The materials utilized to manufacture Clickforsign 2 Inch White Reflective Adhesive Tape, 2 feet, are sourced from the most reliable and official Warning Tapes vendors, chosen after performing detailed market surveys. Thus, Clickforsign products are widely acknowledged in the market for their high quality. We are dedicatedly involved in providing an excellent quality array of Clickforsign Warning Tapes.